By buying this product you can collect up to 6 YaHobby coins. Your cart will total 6 YaHobby coins that can be converted into a voucher of $3.00. Even before WWII broke out, the lightly armed and thinly armored Panzer I tank was considered obsolete. Although the Pz.Kpfw.I didn't have a long combat history, its chassis proved suitable for uses other than those of a tank. One such use was the Flakpanzer I, a self-propelled antiaircraft cannon. It had the advantage of being armored and possessing cross-country mobility. The Sd.Kfz.101 Flakpanzer I was modified from Panzer I Ausf.A tanks by removing the gun turret and installing a single-barreled 2cm FlaK 38 gun. The engine deck and hull were modified as well. Only 24 such Flakpanzer vehicles were produced, and they were subsequently assigned to Fla.Bataillon 614(mot) in May 1941. However, all had met their demise by the end of the Battle of Stalingrad in 1943. 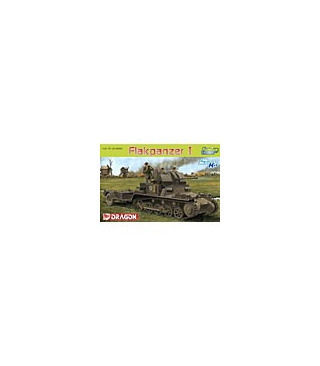 Dragon has reengineered its 1/35 scale Flakpanzer I plastic kit in a new Premium Edition variant. It builds upon the success of the previous kit, but it has received several important updates. These include an improved storage box, which reproduced with both internal and external details. This storage box fits on the Sd.Ah.51 trailer, a piece of equipment that was normally towed behind the armored vehicle. Plus the kit features a new driver's seat and controls in the driver's compartment. In addition, the frontal armor has received the Razor Edge treatment to give it a true-to-scale thickness. Several photo-etched parts give greater realism, including a photo-etched exhaust cover and spent-shell cage on the cannon. To make the modeler's job easier, the kit employs Dragon's patented Magic Tracks. This overhauled kit offers everything the modeler needs to repel marauding aircraft!